OK, I know it shouldn’t be a surprise to me but every time it happens it amazes, and then amuses me, how things on my vision board have an uncanny habit of turning up in my life! My vision board has all sorts of wonderful things on it and some of them are pretty big (OK for big read expensive!) and so while I really want them in my life, I am prepared to wait for my life to be ready to accept them. So imagine my surprise and delight when I realised that one of my most outrageous “visions” was actually here already! I’m a bit of a petrolhead. OK, I know girls are not supposed to be into stuff like that but I have been in love with fast cars since I was about nine, when I stole my cousin’s Matchbox convertible Porsche and refused point blank to give it back! So on my vision board, tucked away in the corner, is my dream car – a Maserati Gran Cabrio. Its a pretty expensive toy so I really wasn’t expecting it to manifest for a good while yet – but the funny thing is, a Maserati has been parked in my garage almost every weekend for the past month! A few weeks ago it was the gorgeous Gran Cabrio, then it was the completely silly Stradale MC, now its the rather grown up Quattroporte! And the really cool thing – I haven’t had to pay for any of them! 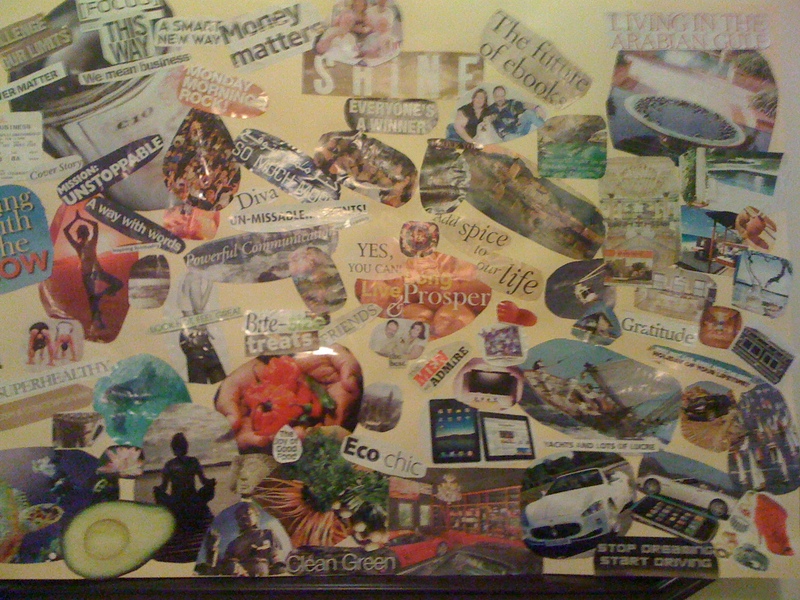 So here’s the thing about vision boards – when you put stuff on them expect the stuff on them to show up! And don’t ask how! And say thank you! I love your board. Have not done mine yet as am moving soon and thought I would do after. Is that an avocado?? yes, I love avocados – they are so delicious and good for you and I would love an avocado tree in my garden one day – so far I’ve got a four inch high one!! isn’t it funny how what we want sometimes just sneaks up on us? That’s why its important to keep noticing and keep being grateful. Chris – listen to Marleen! !